Board of Missions of the Methodist Episcopal Church , “Mission Photograph Album – Portraits #07 Page 0086,” UMC Digital Galleries, accessed November 27, 2018, http://catalog.gcah.org/omeka/items/show/60698. Kawai was born the daughter of a Shinto priest in a small village near Kyoto. 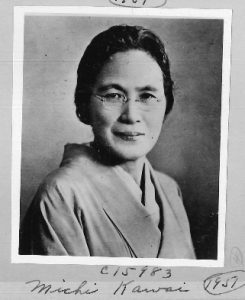 She became a Christian through the influence of an uncle, going first to a Methodist school at age ten and then as a teenager to a Presbyterian school in Hokkaido, where she mastered English. Japanese friends arranged for her to receive a scholarship to Bryn Mawr. She returned to Japan to teach in a school established by Ume Tsuda, one of the famous seven women who first went to the U.S. in 1971. In 1905, an American friend persuaded her to help in bringing the YWCA to Japan, for which she became one of several secretaries and the first Japanese secretary. On another visit to the West Coast, she saw the possibility of the YWCA in Japan preparing Japanese people who were going to emigrate to the United States. She also met many influential foreigners in her YWCA work, such as John R. Mott and John D. Rockefeller. She dreamed of beginning her own girls’ school, a dream that became a reality in 1929. She converted her home in Tokyo into Keisen Jogaku-en school. The school opened with nine girls aged twelve and thirteen. The school was remarkable in being an indigenous Japanese Christian institution. By the time of her death, the school had almost two thousand students and consisted of a junior high, a senior high, and a junior college. She died on February 1, 1953.